I must have missed this card at first, but I would like to say now how much I like it. The vintage stamp is very appealing to me. 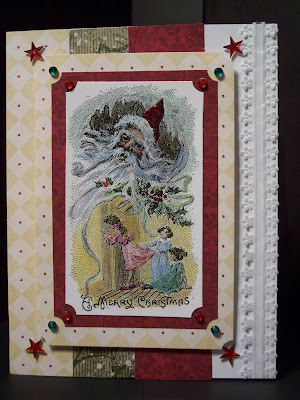 I especially appreciate the background papers and the red star embellishments. It all works together to make a very beautiful card. Who will be the lucky one to find it in her mailbox, I wonder.